Toneea, please e-mail me with your mailing address - and don't forget to tell me which art piece you'd like! Oh, and I've already found more art to add to the give-away board, so I'll have even more choices for you all by next month's drawing. So don't worry if you didn't win this time; I promise there will be plenty more chances! So glad that this amazing artwork found such a wonderful home! <3! Thank you, thank you, thank you for doing that with the Wonder Woman and Flash picture. Seriously. I'm having a pretty lousy week and you just put a bright spot in it. Thank you! Hooray, Toneea! Hooray, Reesey! Good for you both. If you didn't hear my squeals of joy from over there, I'd be greatly surprised.... THANK YOU so much! I am rapt to have won - you have brightened a very average week for me. I am still picking, have it shortlisted to two - just going to ask the hubby's opinion and then let you know. 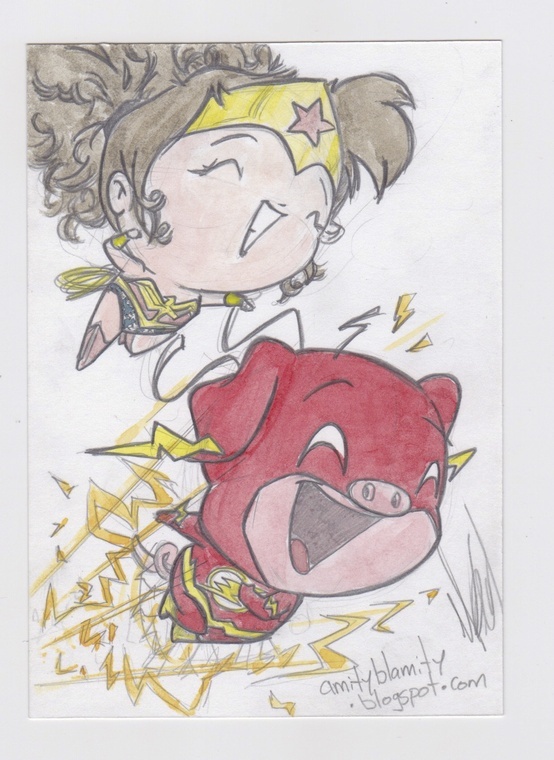 Thank you again and I love what you did with the Wonderwoman/Flash picture. Yippee for Reesey winning the Wonder Woman picture! No! Little girls with cancer must remain miserable, in order to offset everyone else feeling pretty good so the gods don't take notice! ... Okay, no, seriously, did you REALLY think we'd object? You are so lovely to give away the Wonderwoman picture to Reesey. She definately deserves a ray of sunshine! omg you are awesome. THANK YOU SO MUCH!!! reesey is going to have this framed in her room FOR SURE.